There can be no disputing one fact about flying machines...most of them HATE ice. Sure the rich guys up in the flight levels get to tool around in jets and turboprops that are certified for FIKI (flight into known icing), but the rest of us 'Ham and Eggers' have to clod along below FL180, avoiding any opportunity to turn our airplanes into popsicles. As a strictly VFR driver for the past 11 years, I have not cared much about the icing dangers lurking inside freezing wet clouds. But now as an airplane owner and IFR flight student, the chances are high that very soon – when I begin actual IFR training in our new 235 – I will find myself looking at the inside of clouds, the realm of only a fraction of licensed pilots. See, the rub here is that to translate this, you need to either (a) go look up a bunch of NAVAID identifiers in the latest AF/D, or (b) have every freakin' one of the VORs in America memorized. The first option is very time-consuming, and the latter is impossible unless you're Kreskin the Magnificent. But...as always, someone out there on The Internets has developed a solution that is perfectly easy. First, I look at their surface observations for the Northwest, and if I'm off to Cali, the observations for the Southwest as well. Here I get a quick look at ceilings, sky coverage and surface winds. 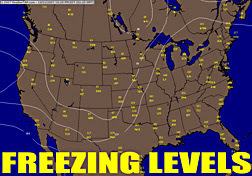 Next, I look at their graphic for freezing levels, which has clean isobar lines depicting the different altitudes where sno-cones may be waiting. I then grab a look at the NEXRAD/Satellite composite, which quickly shows me fronts and precipitation that is occuring. I then glance at winds aloft, presented in a clean graph, and finally, browse the pilot reports for clues to what is REALLY happening. All this for a lousy $2.95 a month! Hell, you can't even buy a decent latte in the Pacific Northwest for under three bucks...weatherTAP is a steal! I don't have any affiliation with them, I just think their services are a very closely-guarded secret in the GA community. 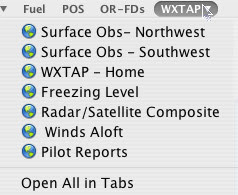 The best deal is $24.95 for two years of the print edition of TAP which gets you subscriber access to their aviation weather.